On Tuesday, United States President Donald Trump tweeted: "Meeting in Singapore with North Korea will hopefully be the start of something big... we will soon see!" By giving a specific time - 9am - for the planned June 12 summit between Mr Trump and Democratic People's Republic of Korea (DPRK) leader Kim Jong Un in Singapore, the White House seems intent on following through on the historic summit. However impulsive Mr Trump may have been when he agreed in early March to the summit, he has now come to realise that the anticipated one-on-one with Mr Kim is just the beginning of the "process" of denuclearisation of the Korean peninsula, meaning rapid denuclearisation is unlikely. Perhaps this realisation is what made Mr Trump put new sanctions against the DPRK on hold. Asked if the DPRK had agreed to "complete, verifiable and irreversible" dismantlement of its nuclear sites and programme, Mr Trump said: "We're not going to go in and sign something on June 12, and we never were." Thus he downplayed the expectations from the summit. "We're going to start a process... but I think they'd like to see something happen." 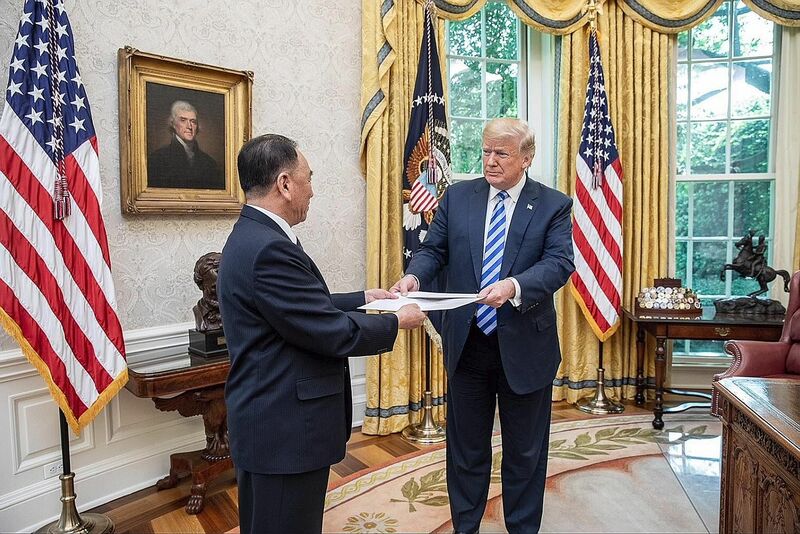 Shortly after his meeting with General Kim Yong Chol, vice-chairman of the DPRK's ruling Workers' Party of Korea central committee, Mr Trump told reporters that he was putting new sanctions against Pyongyang on hold and doesn't want to use the term "maximum pressure" anymore. "We're getting along, so it's not a question of maximum pressure," Mr Trump said. "And at a certain point, I'll tell you what, I look forward to the day when I can take the sanctions off North Korea." A day before his meeting with the DPRK envoy, Mr Trump had said it could take several meetings to reach an agreement. In Pyongyang, the official Korean Central News Agency reported that Mr Kim hoped US-DPRK relations will improve and denuclearisation of the peninsula will be achieved on a "stage-by-stage" basis. After the turbulence and drama surrounding the on-again, off-again Trump-Kim summit, it is perhaps safe to say the two leaders are now on the same page on at least one aspect - there is no quick fix to denuclearisation. Which is important because realising that denuclearising takes time will make people more rational about what to expect from the first Trump-Kim meeting days before it opens. It also allows deliberation on what steps to take before the summit and during the critical period afterwards. Pyongyang has stopped its nuclear and missile tests, demolished a nuclear test site and released three American prisoners, and Mr Kim has held a second meeting with Republic of Korea President Moon Jae In in the run-up to the planned summit. Mr Trump's offer of keeping on hold new sanctions is a good gesture. And given the long-term goal and the efforts needed to achieve it, it is important for the two countries to continue meeting each other halfway, with sincerity, so they can achieve what they and the international community hope for. Their efforts could ultimately usher in a new era for the peninsula, one of denuclearisation, peace and prosperity. For a long time, "reunification" has been a North Korean monopoly. At any inter-Korea event, North Koreans led singing of the song Our Wish Is Reunification, and when drafting a joint communique, it was the Pyongyang side that provided strong wording to vow joint efforts to achieve the national goal. South Korea has the Ministry of (Re)unification to take charge of inter-Korea affairs, but the Department of United Front of North Korea's ruling Workers' Party is many times more powerful, combining intelligence, counter-intelligence, propaganda and other overt and covert operations related to "reunification" with the South. Ask a little schoolboy on a Pyongyang street what the most important thing is for his country, and the instant answer is "reunifying with the southern half after driving the Americans out!" Reunification has been the religion of North Koreans from the supreme leader on down since the days of Mr Kim Il Sung, who started a war against South Korea two years after he founded the Democratic People's Republic of Korea (DPRK) in 1948. Seventy years later, that national obsession seems to have withered in the North. Pyongyang leaders are now desperate to get Washington's guarantee of the security of their regime in exchange for giving up their nuclear programmes. The simultaneous negotiations between US and North Korean officials in Washington, New York, Singapore and in the Korean truce village of Panmunjom over the past few weeks boiled down to how the most powerful nation in the world should ensure the continued existence of the DPRK, if and when the latter discarded its nuclear arsenal entirely. A United States guarantee of ceasing hostilities needs to take the form of a peace agreement ratified by the Senate. Prior to that, the two parties will have to declare a formal end to the Korean War. Fighting had stopped in 1953 with an armistice agreement. When Pyongyang adopted the "military first" policy in the 1990s, spurring what then were rudimentary programmes to develop weapons of mass destruction, it was aimed at securing the regime's survival in a changing world which saw the collapse of the Soviet Union and the opening up of China. The dream of reunification with the South faded as the economic gap between the two Koreas widened. The North's nuclear and missile development progressed faster than the US and surrounding powers had estimated and reached the red line that Washington officials drew about the threats from this communist state. Now, North Korea offers denuclearisation in exchange for Washington's respect for its sovereignty. While we wish complete denuclearisation of the Korean peninsula as eagerly as the Trump White House does, the crucial question is - what about the many gulags in North Korea and hundreds of thousands of political prisoners there? South Koreans cannot comfortably envision the perpetuation of the Kim dynasty in the North with the Trump administration denying the possibility of preventive or pre-emptive attack on the North or attempts to overthrow its current leadership by the Central Intelligence Agency. We want the people living in the North Korean territory to be free of hunger and fear, to be able to speak out freely and to be able to communicate with the outside world so that they can make life choices knowing what is going on near and far. It is hard to imagine that such a thing will become reality unless the Pyongyang regime fundamentally changes itself. We hope that Mr Kim Jong Un has learnt to tell what is possible from what is not since he took over from his late father, and has decided to turn over his country's nuclear weapons to the international community on the highest bet so he can feed his people better. Once the deal is made in Singapore and through further negotiations, inter-Korea relations will enter a new chapter that will call for cooperation, which will depend on how Pyongyang behaves in the future. Then, reunification will become a slightly more attainable national goal on this peninsula. Will human rights issue be on agenda? Concern is growing among Japanese diplomatic officials and others over whether human rights issues, including Pyongyang's abduction of Japanese nationals, will be discussed in detail at a US-North Korea summit meeting scheduled for June 12 in Singapore. This concern has been prompted by the fact that US President Donald Trump did not talk about human rights issues at a meeting with General Kim Yong Chol, vice-chairman of the Workers' Party of Korea. Regarding the abduction issue, Mr Trump expressed his intention to make full efforts to achieve the return of Japanese abductees to Japan at a press conference after a meeting with Prime Minister Shinzo Abe in April. "Abduction is a very important issue for me because it's very important to your Prime Minister," Mr Trump said. Mr Trump has given top priority to the full denuclearisation of North Korea. To make progress in the process of normalising diplomatic ties with North Korea in the future, which the US is now discussing as a reward for Pyongyang's denuclearisation, it is crucial to improve the situation regarding the North's human rights violations.